As the Star Wars universe expands exponentially, we’re going to get to meet all kinds of new characters and go on all sorts of fun new adventures. And of course we’re going to get to hang out with some familiar faces as well, most notably Luke Skywalker, Princess Leia, and Han Solo. That’s pretty awesome. When we found out that some characters were going to show up again, it kicked off an avalanche of speculation about who might return, and when we found out who, people were bummed that maybe their favorite was left out. With so many more movies on the way, there are ample opportunities for others to reprise their roles, and one former player thinks that he will be back for another movie eventually. 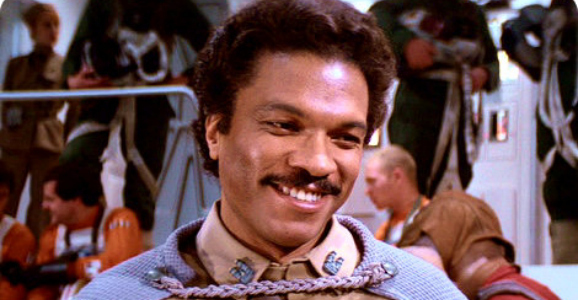 One notable absence in Star Wars: The Force Awakens is Billy Dee Williams’ Lando Calrissian. That’s a bummer, as lots of us would love to see what he’s been up to since he blew up the Death Star in Return of the Jedi. Lando did show up recently on the animated series Star Wars Rebels, with Williams providing the voice, and though he won’t be on the big screen come December 18, he expects that it is only a matter of time before he rejoins that far, far away galaxy. Yeah, people were pretty upset about it. But I uh…I may very well…I have a feeling I’m going to show up. There’s nothing I can really discuss about it at this stage. People think of me as the original cast, but I didn’t come in until the second movie. I did Empire and then I did Return of the Jedi, but I came in after everyone else was introduced…So I think they’re probably proceeding in that way. I can’t imagine them not bringing Lando back. But we’ll see, I don’t know. This is obviously nothing official in any way, and looking at the language he uses, it’s hard to tell if this is something that has been discussed by Williams and the folks at Disney and Lucasfilm, or just a feeling that he has. We’ll have to wait and see how all of this shakes out, but what would you say to seeing Lando taking another turn the Star Wars universe? Maybe at the helm of the Millennium Falcon again? I still wonder if he doesn’t pop up in some small cameo towards the end of the film. Something along the lines of the post credits scenes Marvel does. Not necessarily post credit, but something small and totally unexpected at the very end of the movie. Considering both Disney and Abrams pension for these sorts of surprises and twists I could see it. Especially considering the weird “but uh… I may very well…” comment. The fans want him, Billy Dee is voicing the Rebels cartoon and he’s raring to go. Signs point to him showing up and everyone is just being coy about it. It’s the whole ST / Khan thing again just wrapped up in a SW candy shell.